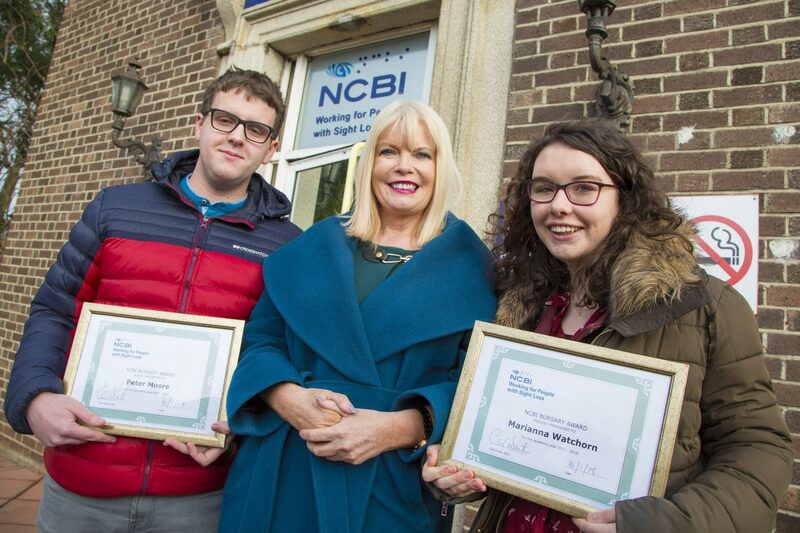 On Wednesday the 31st of January, Minister for Higher Education, Mary Mitchell O’Connor presented Marianna Watchorn and Peter Moore with the NCBI Bursary award in the National Council for the Blind of Ireland’s Head Office. This is the introductory year of the annual NCBI Bursary award. NCBI is Ireland’s national sight loss agency and recognised the need for appropriate financial supports for young people who are blind and vision impaired as they progress in education. NCBI’s annual bursary is to the value of €3,000 per annum, with €1,500 available for a male student and €1,500 for a female student. This sum will be paid annually for up to four years, giving the students a total contribution of up to €6,000 towards their education. For further information on how to apply for next year go to www.ncbi.ie.